This version of this model is known to run in both OpenCell and COR. The units have been checked and they are consistent. A generic stimulus protocol has been added to allow the model to simulate trains of action potentials. Although the model does run, the simulation output is still not quite the same as the original published model. The original model authors have been contacted and we will continue to curate the CellML model. ABSTRACT: In this paper we introduce and study a model for electrical activity of cardiac membrane which incorporates only an inward and an outward current. This model is useful for three reasons: (1) Its simplicity, comparable to the FitzHugh-Nagumo model, makes it useful in numerical simulations, especially in two or three spatial dimensions where numerical efficiency is so important. (2) It can be understood analytically without recourse to numerical simulations. This allows us to determine rather completely how the parameters in the model affect its behavior which in turn provides insight into the effects of the many parameters in more realistic models. (3) It naturally gives rise to a one-dimensional map which specifies the action potential duration as a function of the previous diastolic interval. For certain parameter values, this map exhibits a new phenomenon--subcritical alternans--that does not occur for the commonly used exponential map. 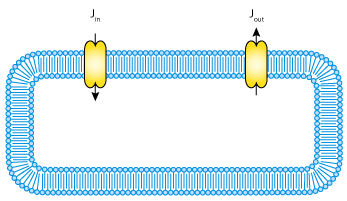 A schematic diagram of the two ionic currents described by the Mitchell-Schaeffer model of a ventricular myocyte. Derived from workspace Mitchell, Schaeffer, 2003 at changeset 25103ab3451d.